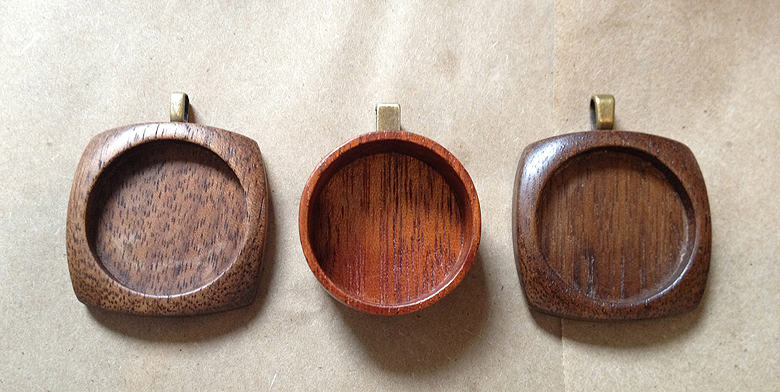 I found these gorgeous wooden bezels at an Etsy store called Art Base. 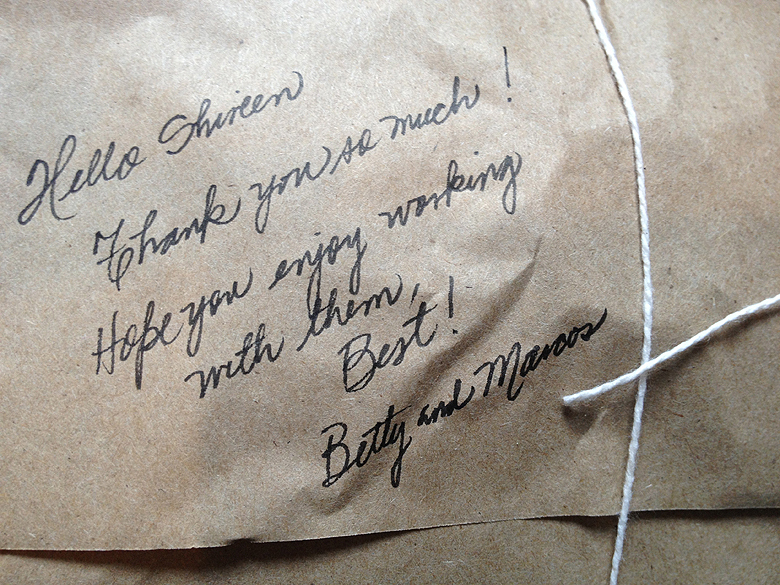 Right from the moment they arrived I was delighted – even the wrapping is lovely, and contains a sweet, handwritten note. It’s the little things. The bezels themselves are a delight to work with – the craftsmanship is amazing, the edges are perfect, and there is no rough detail to cause the resin to misbehave. It was so hard to decide what to make with them, but I finally settled on 3 ideas. This one contains the seedpods of a bursting heart plant. 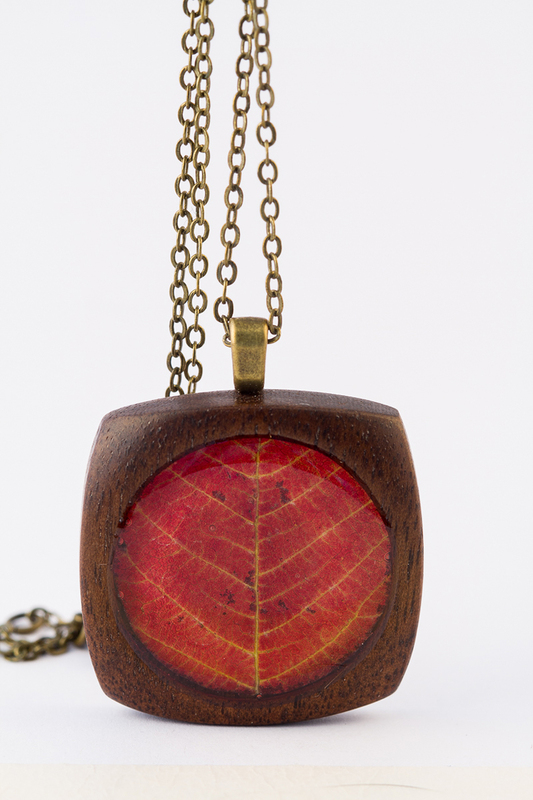 And this one features a sumach leaf – the colour and detail really compliment the dark wood. 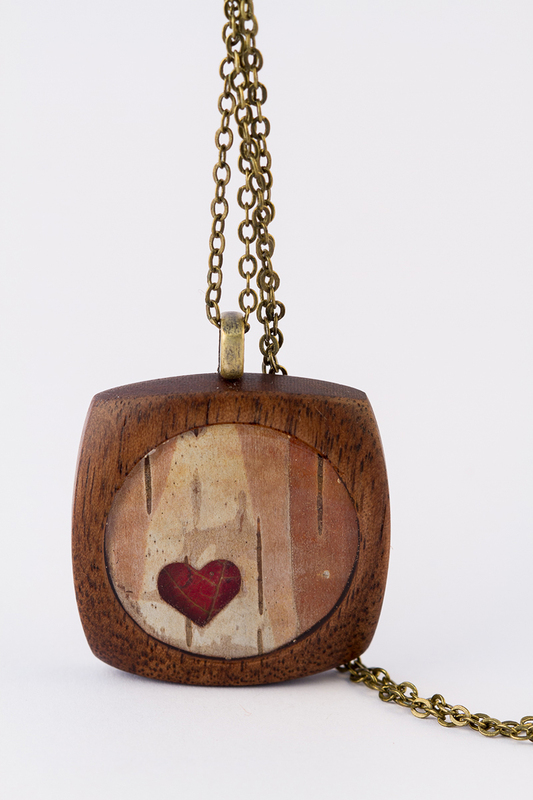 This last one is a pendant version of the ‘I ♥ Autumn Ring’ from my Resin Jewelry book. They have such a lovely, natural looks to them. 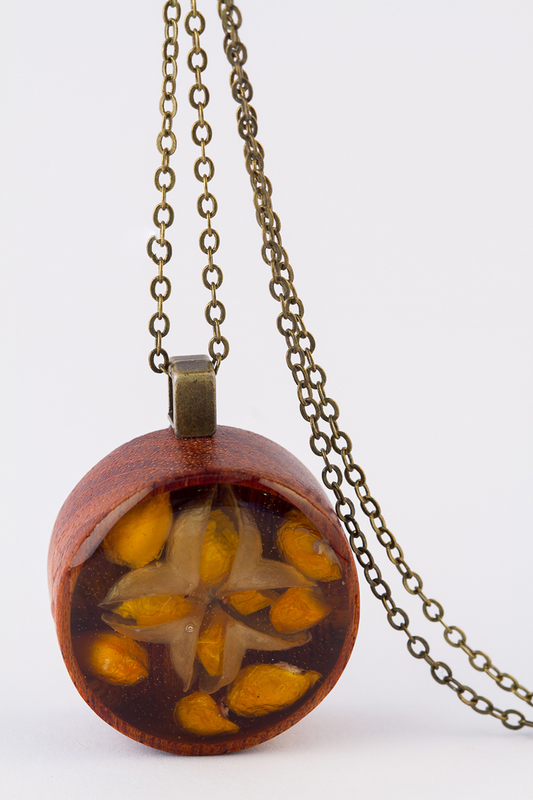 Wooden bezels, seeds, sumach and birch bark. What could be more autumnal? I will definitely be ordering more! 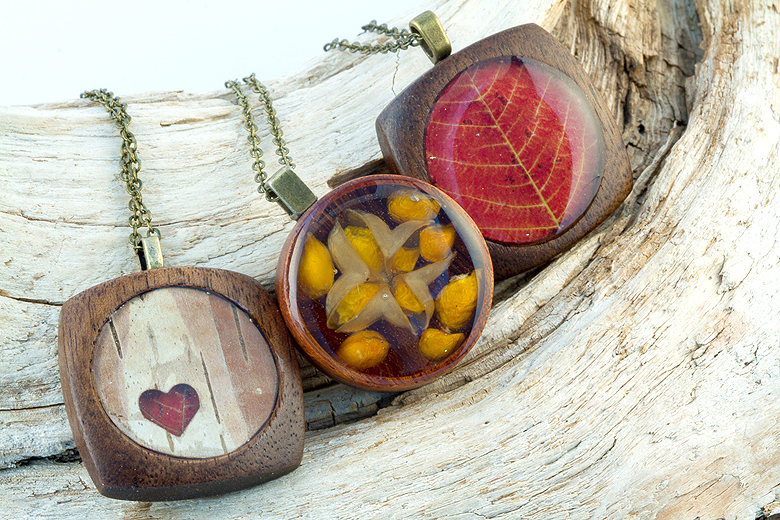 The combination of these wooden bezels and your resin work is stunning! So glad you linked to these! I’ll be purchasing some. So, the kids (two younger ones) and I were sitting in the school yard waiting for the big one to return on the school bus. My youngest had had a bad day at school as only a grade one girl can. She was sitting in my lap crying hard. Once she was done, I kissed her head and sent her to the play structure to be with her friends. As she scampered off, I looked down to see a tiny little leaf on my lap, perfectly formed in the shape of a heart. That little leaf went in between some paperwork from my son and into his lunch box for safe keeping. it’s now in my treasure box for when I finally have all of my supplies. Your blog and book are so inspirational for me in seeing the world in a different way. I would have kept the leaf anyway, but it would eventually have gotten lost rather than me finding a way to preserve it for her. Thank you again for sharing your talent with us. That story was so wonderful – you’ve hit at the heart of why I love resin so much! Thanks Carol, for sharing that little story with me! Thank you for giving me a way to give back to my kids. Now how do I get their four leaf clovers off the tape in one piece? Yes they all have one. My ex was amazing at finding them. All three came from our back yard. Eek! If there is tape on the back it might be best to cut around the tape and leave it where it is. Possible? Maybe with grooming scissors?